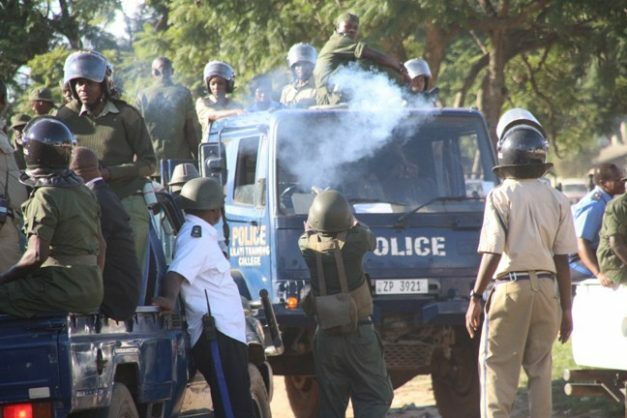 Some traffic police officers in Chipata yesterday detained and tortured Eastern Province Muvi TV bureau chief Oswald Yamani for filming officers attempting to arrest a motorist who was resisting. The traffic officers grabbed a camera from Yambani, paper sprayed him in the month and eyes before locking him up. Yambani confirmed the incident in an interview with The Mast newspaper, saying traffic officers humiliated him before taking him to Chipata Central Police where he was locked up in a room. “I was filming traffic police officers who were attempting to arrest the motorist who resisted an arrest and when these three traffic officers saw me, they ordered me to stop and then brutally got me to the police station. The officers humiliated and insulted me for filming them, locked me in the room where I was paper sprayed and they threw in a tear gas before closing windows and the door,” Yambani narrated. And according to an eye witness who talked to online publication News Diggers!, the incident happened along Umozi Highway around 09:20. “There was a fracas here in Chipata. I saw about three officers trying to arrest a motorist but he was resisting, you know how they can be. So while that was going on, one of them turned around and noticed that Oswald was filming the incident. They grabbed him, confiscated his camera. He tried to hold on to a fence but they harassed him and they threw him into their office. They locked him in the office and they sprayed the room with some tear gas,” narrated the witness. And Eastern Province police commissioner Alex Chilufya said the traffic officers would be disciplined. “I refer to this morning’s situation involving our Traffic Officers and Mr. Oswald from Muvi TV. I confirm that there was a misunderstanding arising from a street filming of officer’s operations which caused an overreaction on the part of some of our Traffic Officers against Mr Oswald. The latter was taken to the Police Station but I wish to state that my office intervened promptly to avert any further misplaced action against the Journalist. My Office invited Mr Oswald for a discussion and regretted his mishandling. However, an amicable, mutual understanding and appreciation were reached,” stated Chilufya. Both the police and the muvi guy shld be responsible enough in carrying out their duties. Such incidences could be avoided. While the police wl discipline its erring officers a move which is commendable MUVI should also do something to caution its unresponsible reporters to be ethical and professional in their reporting. Am sure the police were fearing the way MUVI misconducts itself by alarming the public with exagerations or jst fabrications. So pls MUVI management shld do somethng if they are nt UNPROFESSIONAL themselves! My deluded friend. There are a few things that you infer to that are wrong on several levels. 1. A journalist taking a picture or recording a video of what is occurring is a free person. All journalist are free to record anything that happens. It is not only party political events that journalist are allowed to cover. The world has a right to know the truth of what happens. The police officers are acting in accordance with a constitutional mandate and authority when carrying out their “protect and serve” imperative. It is never illegal to have a journalist record a public servant at work. It is even expected. 2. Your misunderstanding of what ethics are is surprising. Ethics does not mean kneeling to PF officials or politicians or government officers. Spend some time understanding ethics and journalism. 3. Muvi TV cannot alarm the public by stating facts. That is not alarming the public by any stretch of imagination. If you are caught walking naked and a journalist records your dumb action, that is no alarming the nation. You are shockingly ignorant about basic things. I wouldnt support any one who vitimises some one who is on duty , the traffic officers were on duty so was the repporter respect must be insured for all at work , at times our men in uniform abuse the power given to them by the government. The reporter was at work he should be respected also just as the police should , however I would say treating your fellow human being in such away is evil . When will Zambians understand that you are not not meat, you are not slaves, you are not animals. The police are public servants and not Jesus Christ to be worshiped. Police are not judges, debt collectors, or legislators. Police do not exist to extort money, favours or sexual favours from people. Police do not have the right to use excessive force to effect their “protect and serve” mandate. The police know this and get very agitated when a journalist records them overstepping their mandated boundaries. Cops know this. Zambians need to know what they more than just meat. Some media houses lyk the one here cant be trusted because of twisting the informstion to suit their sponsors. Am tokng frm xperience so i knw what they do. Dats why they were once found wanting by the law. If u hv nt seen it wait one day u wl prove me rite. We no longer trust muvi some of us and u cnt force me to do so. They sometmz behv very unprofessional and unethical jst work on dat weakness ba muvi. Your logic and thinking is strange to say the least. Were you by chance writing while drunk or under the influence of some psychotropic substance? Have you done any tertiary education that requires critical thinking or one that develops an even slight analytical mind? You seem to be oblivious to normal reasoning in your posting. When a reporter records a police officer / police officers unlawfully assaulting a person or persons and presents facts to the public, how does that become “twisting information”. You remind me of the former Minister, Newstead Zimba. He was recorded fighting with his wife on film. The then Minister went on to say that he was “misquoted”. I do not wish to convince you to support my view. I question your common sense. Locally, nationally and internationally journalists have the responsibility to record facts as these facts present themselves. If a police officer (public servant) is overstepping their mandate and is recorded doing so by a journalist. That is not poor reporting, my friend. If a journalist found a police officer and voiced over the words of a cop to make it seem as if a cop had verbally abused when in actual fact not. That would be unethical. If a journalist found a car accident and saw people lying in agony dying and (s)he repositioned the bodies of a person then took a picture, that would be unethical. If a journalist got an actor to mimic a police officer and organised for a recording of a fake police officer drunk or abusing authority or demanding a bribe. Then if the journalist reported this as a true police officer, that would be unethical. If a journalist records an altercation between you and a prostitute, the journalist is not being unethical. If it happened then it happened. You may not like it, but it happened. When a police officer abuses their authority and unlawfully detains a journalist, pepper sprays the journalist and tear gases the journalist in a closed room for recording police officers harassing a motorist that is entirely legal and above board. The actions of the police officers was, is and will forever be wrong and illegal. Those cops can and should face prosecution if all things are to be equal. If a person is subdued and in custody, it is illegal to tear gas them and pepper spray them. Even if you’re a police officer, you need to have limits. You are police not God or the Devil. I’ve a project that I am simply now operating on, and I’ve been at the look out for such info.